Friday at Black Deer Festival came to a close with headliners Striking Matches on the Ridge Stage. 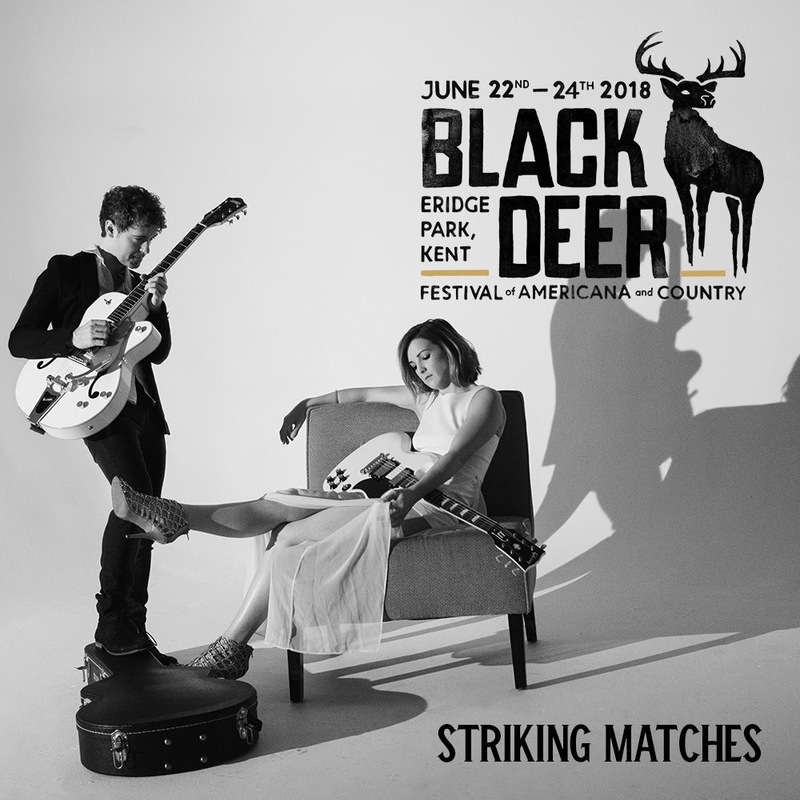 US duo Striking Matches have been a firm favourite with UK fans since their first appearance at C2C Festival back in 2014 and the UK’s relationship with Justin Davis and Sarah Zimmerman who make up Striking Matches has been and will be an ever lasting one. Striking Matches are very much a live act and never disappoint. Both Sarah and Justin being phenomenal guitar players and having possibly the best guitar faces in the business can also both proudly boast brilliant vocals as well as exceptional writing skills. It meant something not just to Sarah and Justin but to us fans to see them as a headliner and we are all grateful to Black Deer for that as it is deserved. From seeing Striking Matches live on a large number of occasions it had been a good while since I last saw them and they have just got better and better. One thing I did notice was how they have become more confident with their crowd interaction, Justin especially. It was clear to see how they wanted to make their headline performance a memorable one by how much Justin was getting the crowd to interact and getting them all geared up and energetic. The duo began their set with relatively new single Retrograde and songs off of their new EP Shameless which included a fun version of Medicine where an eager Justin got the crowd to sing along by traching us the words first. The duo also played a brand new song which they tested on the Black Deer audience. Striking Matches new music goes in a slightly new direction to what we are used to from the duo but as a guitar driven act, their music is still just as good and translates very well within a live setting. I am undecided if starting the set with five newish songs was a great idea or not. You can’t fault the new music but I would have like to have it mixed up a bit but then again maybe I wouldn’t have? As I said, undecided. Either way, the set was just as engaging and powerful as ever and they performed as just a duo rather than with a band which is where I think their strength lies because the chemistry between them is so strong as is their playing that they need no accompaniment. Striking Matches played crowd pleasers such as When The Right One Comes Along, Make A Liar Out Of Me, Trouble is as Trouble Does as well as a very surprising but happily met stripped back and slowed down version of Rick Astley’s Never Gonna Give You Up. Hearing the crowd sing with Justin and Sarah on that one was a lot of fun, they gave a great version. Just as Justin announced “we have one more song to go” and just as he was about to say his thanks to the crowd Sarah was approached by Festival staff to finish. Sarah turns to Justin and says “we’re done” . Looking bewildered, disappointed and feeling rather awkward Sarah and Justin stood still for a moment before saying “I guess that’s it” which made the crowd boo. It was awkward as there was no end, no finale and no closing cheer from the crowd as everyone was stunned. But…being the striking duo that Striking Matches are, they grabbed their guitars, stood down stage and performed unplugged. “Sing along with us” shouted Sarah “we’re gonna need you”. With this, Sarah and Justin performed the much loved song Ain’t Leaving Without Your Love. Everyone who knew it sung along and it was quite an emotional performance due to the circumstances. If we weren’t already standing up then they would have undoubtedly received a standing ovation. In a way, I think being cut off went in their favour as they went that extra mile for the fans and received a hell of a loud roar from the grateful crowd. As I left, all the way back to the campsite I heard people raving about them.